Head lice are tiny insects that live on the human body and consume blood from the human scalp, and this feeling is what makes a person itch. Head lice are highly contagious. An infestation of head lice called pediculosis capitis. While Head lice don’t carry bacterial or viral infectious diseases. A head lice infestation isn't a sign of poor personal hygiene or an unclean living environment, having them can be itchy and uncomfortable. Lice have existed for as long as humans. While some types of lice can remain elsewhere on the body, the most common species live in the hair on the head. While anyone can contract lice, most often they affect children who attend preschools or elementary schools and usually result from the direct transfer of lice from the hair of one person to the hair of another. It is important to note that having lice does not indicate poor hygiene. They can only survive for a few hours outside of a human scalp. lice cannot survive long without feeding. They should go to a new head within about 24 hours, or they will die. Over-the-counter and prescription medicines are available for treatment of head lice. A number of home or natural remedies are used to treat head lice infestations, but there is little to no clinical evidence of their effectiveness. Researchers are unsure where lice originate, but they know that the lice have affected primates for at least 25 million years, eventually spreading to human bodies or other. We must know Head lice crawl and only affect humans, and they will not jump onto pets or other animals. Most often transmission of head lice from one person to another is by direct contact. Therefore, transmission is most often within a family or among children who have a close contact at school or play. head lice are tan or grayish insects about the size of a strawberry seed. They feed on human blood that it extracts from the scalp. The female lice produce a sticky material that agglutinates each egg to a hair shaft. An egg is attached approximately 4 millimeters from the base of the shaft. A louse egg hatches after eight or nine days, that emerges is an immature form of the louse called a nymph. The nymph becomes a mature adult louse after nine to 12 days, and an adult lives for three to four weeks. Some people believe that girls are more sensitive to lice than boys because they have long hair and more head-to-head contact. But lice are also common in boys. 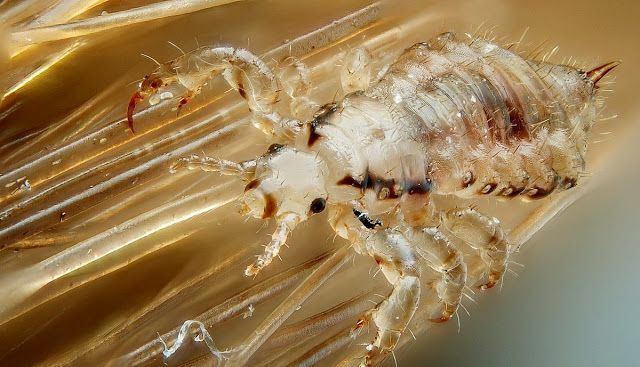 Researchers found in their study, lice can spread through physical contact. They cannot fly or jump, but they can crawl from head to head. This can happen when people get hair color during close contact. It can also travel on objects that have touched the head. Sharing goods coming in contact with the head can increase the risk of being a person's life. Poor communication can also be a risk factor. If a person has lice, then it is necessary to inform everyone in close contact. If a child has lice, a parent or caregiver should notify the school or day-care. Primary school- or girls of preschool age group are more likely to be lice. An indirect transfer could also occur among items of clothing stored together. For example, a hat on a single hook or a scarf or a school locker stored in the same lock can work as a vehicle to transmit. The primary symptom of lunar nuisance is the presence of live lice on a person's head. The best place to look for live lice is on the skull behind the ear. If a lick does not seem to exist then one person can not be an active nuisance. You may not be aware of the nuisance of the lice. However, common signs and symptoms can include skin irritation, sleeping problems, itchiness, scratching the head, swollen lymph nodes, a crawling sensation. Itching on the scalp, neck, and ear is the most common symptom. This is an allergic reaction to saliva to survive. When a person is a nuisance for the first time, it can not be itchy for two to six weeks after the nuisance. Lice eggs (nits) on hair shafts. Nits stick to hair shafts. It can be difficult to observe nits because they are very small They are the easiest to spot around the hairline of the ears and neck. Spotting blank nights can be easy because they are light in color and are ahead of the skull. Lice on the skull Lice may appear but it is difficult to spot because they are small, avoid light and move faster. These symptoms can indicate many issues, so it is important to confirm the presence of lice before starting treatment. If you suspect that you or your child is having trouble with the thighs, then look at your doctor before starting treatment. Studies show that many children have been treated with over-the-counter medicines or home remedies for head juice when they do not have active head lice infections. Treatment usually fails if a person does not remove all the lice within a few inches of the scalp. This can lead to redistribution. If a person has used the drug properly and remains lice, then he should ask the doctor about prescription treatment. If the first failed, do not use the second OTC drug. We must also know that the juices are not harmful, but they are highly contagious and can be uncomfortable. If a person has symptoms of lice or notices them in the child, then they should be treated. Other small insects found in the hair. A doctor or pharmacist can help someone choose the best method of treatment. After the treatment instructions, it is important to carefully clean your scalp and lice and their egg hair. Standard treatments include over-the-counter liquids, shampoos, and lotions called pediculicides. In some cases, prescription treatments are necessary. These medicines, such as spinosad or malathion, are quite strong compared to OTC varieties. Doctors recommend only when OTC methods have not worked. Many effective medications can also eradicate lice but OTC medications are often effective, these products contain medication that kills the lice. Packaging will include instructions on leaving the product on the hair, and it is important to follow these guidelines. After 12 hours, the dead person can use a very good comb known as a knight comb to remove eggs and lice. To do this, divide the hair into sections. Fight hair from the tips to the tips, until all the lunches are gone. The problem of lice is relatively common among people and the risk of being easily infectious. When you share personal items (like hair combs, hair scissors or hats), it is easy to carry the lice from person to person. People are infected, especially with the head of their hair; It attracts specific types of insects. Due to the nature of this infection, it is most common because of their large tendency to play in young children (in preschool or primary school), often due to interaction and exchange of commodities. It is not recommended to use any type of treatment against the lice which come only when it is confirmed due to the problem. Onion: The onion contains a large percentage of sulfur, which works to eliminate the head lice. Take 5 onions and then extract them onion juice with the scalp and put it on your hair covered with a plastic hat and leave it for three hours, then wash your hair with shampoo and repeat this method for three consecutive days every week until the lice are eliminated. 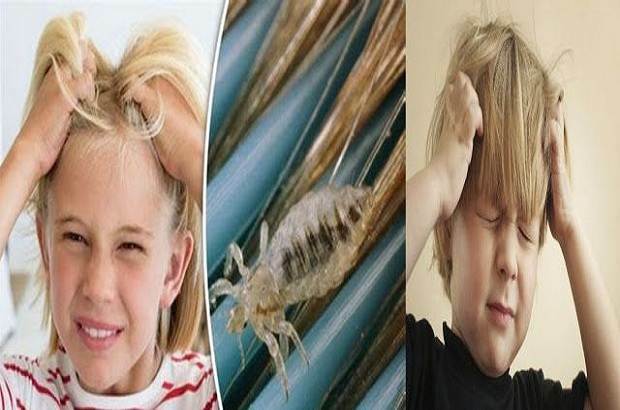 White vinegar: vinegar is an effective treatment to eliminate the head lice. By mixing two tablespoons of vinegar with six teaspoons of water, then put on the hair, wrap the hair and cover the head with a clean cloth, and leave him 10 minutes and then wash the hair with water and repeat this remedy two or three times a week. Mayonnaise: It has an effective ability to eliminate hair lice. So cover your hair with a suitable amount of mayonnaise and then cover your hair with a plastic hat and leave for 5 hours, then wash your hair shampoo and repeat it once a week for two months. Lemon and ginger: They are very effective remedies for the treatment of head lice. Mix the lemon juice with ginger and then put on the head for half an hour and then wash the hair with shampoo and it can be repeated until the elimination of lice. Olive oil and Vaseline: Mix a mixture of equal amounts of olive oil and Vaseline and mix them together and put them on the head, and then cover the head with a plastic hat to the next morning, and then wash with shampoo. Basil leaves: Fresh basil leaves are washed and placed in the blender. Add a little water to the dough. Add the whole hair, leave half an hour to dry and then wash the hair with shampoo. Hair should be checked every 2 - 3 weeks for prevention. Take care of personal hygiene and wash your hair constantly to avoid injury. Change clothes daily as lice live on soiled clothes. Take care to wash clothes with hot water to eliminate the lice. All that is said in this paragraph is simple home remedies, so it is best to repeat them twice a week to get better results. It is also necessary to clean and wash bedspreads, pillows, and blankets to make sure to get rid of head lice.